Fishing Rock: The fish rock tour includes a walking tour along the Xwísten (Bridge River) fishing grounds where the St'at'imc people still fish every summer to gather their salmon for the winter. 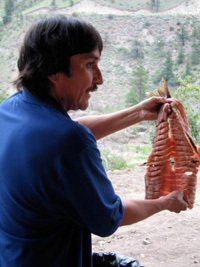 A demonstration is provided of how the St'at'imc wind dry salmon which includes cutting the salmon and preparing the salmon for hanging for wind drying, a sample of the wind-dried salmon is provided. S7ístken Site Tour: The archaeology site tour guide will provide a short walking tour of the archeological village, home to over 80 cultural depressions. This site is currently being studied by the University of Montana and we are able to share the history they are learning about the site with our tours. During the summers of 2012, 2013, 2014 & 2016 they actively excavated and studied Housepit 54. They have now completed their excavation and we are hoping to find funding to be able to showcase the excavation. Our community has rebuilt one of the S7ístkens (pithouses) and the tourists can enter the pithouse and see what one of our traditional winter homes on the site would have been like. BBQ Salmon Meal: The meal includes a serving of Fraser River salmon cooked over the BBQ, rice, salad, asparagus, bannock, and bottled water. The dessert is a traditional treat of whipped soapberries (sxúsum). Education Groups Please contact us for discount prices! & Travel Trade Please contact us for net rates! Generally we are open June 1st to September 30th annually. We are open 7 days a week during these months with one exception; we are closed Labour Day in September. We can accommodate groups in April and May but we need at least one week notice for the booking.